New EAMUs have been issued for the use of Bayer’s fungicide Nativo 75WG (tebuconazole + trifloxystrobin) on leek, salad onion, swede, turnip, celeriac and celery. Based on a mutual recognition from Belgium these EAMUs include the return of leeks to the label, which had been lost in the tebuconazole review some years ago. 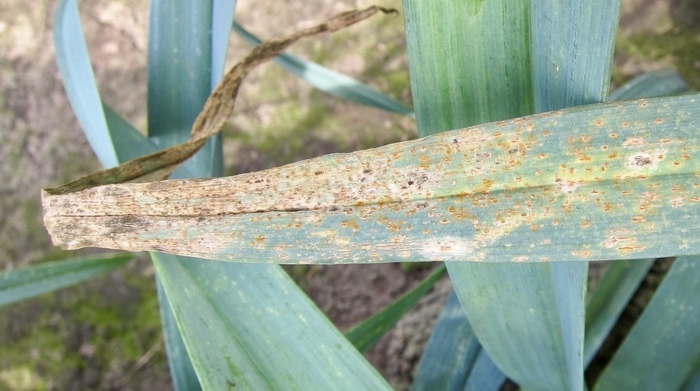 Fresh Produce Consultancy’s David Norman says it’s a welcome return of a product with good activity on leek rust and will plug a gap created by the reduction in the number of other fungicide applications permitted next season. For celery and celeriac growers it brings an excellent level of control of celery late blight (Septoria apiicola). It was included as product AHDB9894 in the AHDB SCEPTREplus trial carried out this year by Aoife O’Driscoll at ADAS Boxworth, where it gave one of the best levels of disease control.Mr Norman adds that prior to this celery growers only had two fungicides, numbers of applications of which will also be reduced for 2019, so it is a most timely addition. The maximum number of treatments and maximum individual doses by crop are; leek and salad onion, one treatment @ 0.36 kg/ha; swede and turnip, two treatments @ 0.36 kg/ha; celeriac, two treatments @ 0.30 kg/ha and; celery 3 treatments @ 0.30 kg/ha. On all crops the latest time of application is 21 days before harvest and a 12m non-reducible aquatic buffer zone applies to use on all vegetable crops.